We always have one date night every month. Guess what we’re doing this weekend? Yep, we’re going to grab some dinner and go see the new Ghostbusters movie that just came out! 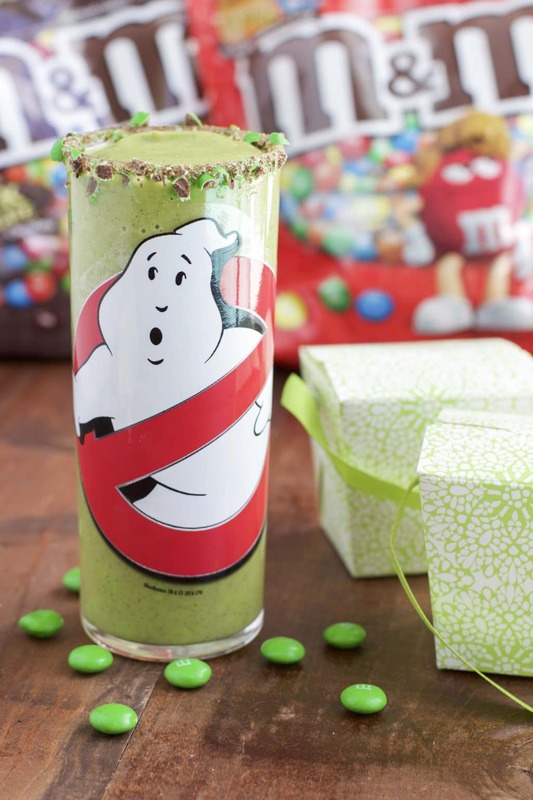 The morning of our date night, I’m going to make this Ghostbusters slime smoothie for Travis for breakfast. I think it will get him excited to see the new Ghostbusters movie later that night! I gave Travis’ cup a special touch by putting a Ghostbusters logo sticker on it that I found in the toy aisle at Walmart. He’s going to flip when he sees it! 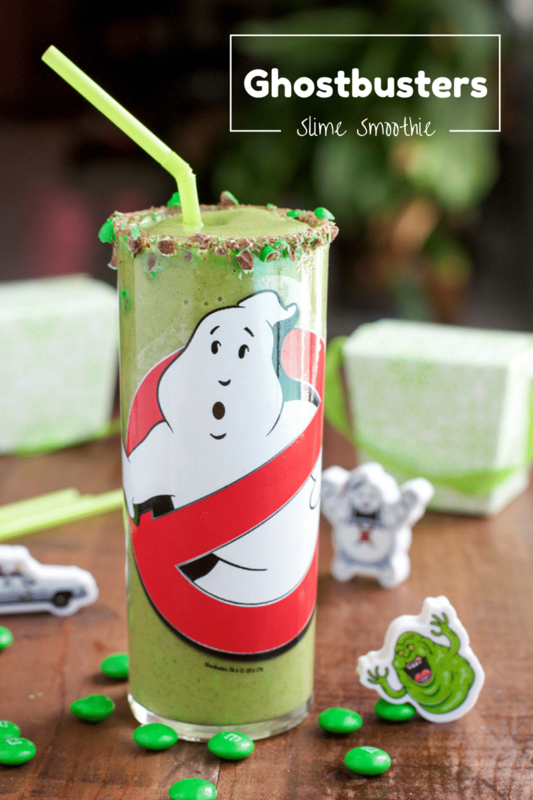 This Ghostbusters slime smoothie would also be a great after school snack! It’s very filling and will hold the kids over until dinner time. It’s mostly kiwis which give the perfect ectoplasm green slime color. 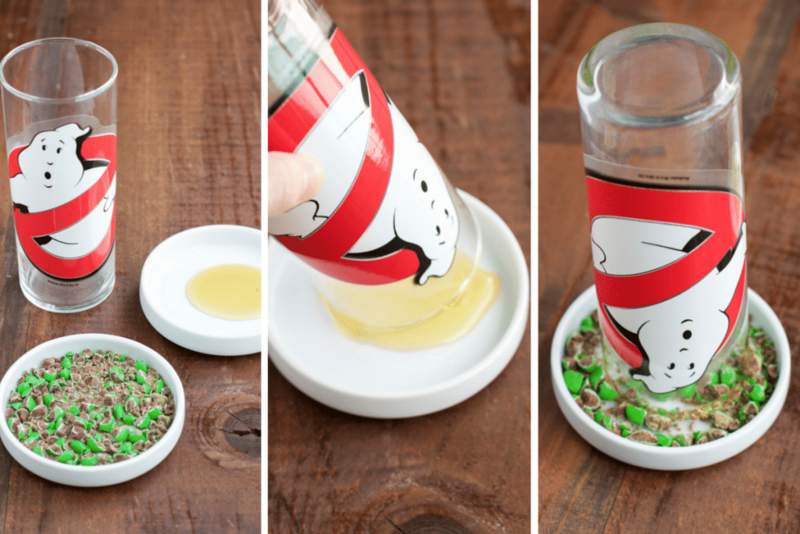 Kids will love thinking they are drinking ghost slime with a sweet crushed green M&M’s® milk chocolate rimmed glass. I coated the rim with honey to help the crushed M&M’s® milk chocolate stick to the rim. It worked really well! Just make sure you chop or crush the M&M’s® milk chocolate small enough so they can stick to the honey easily. I just know Travis is going to love it. It’s going to bring him back to his glory days! Ha! 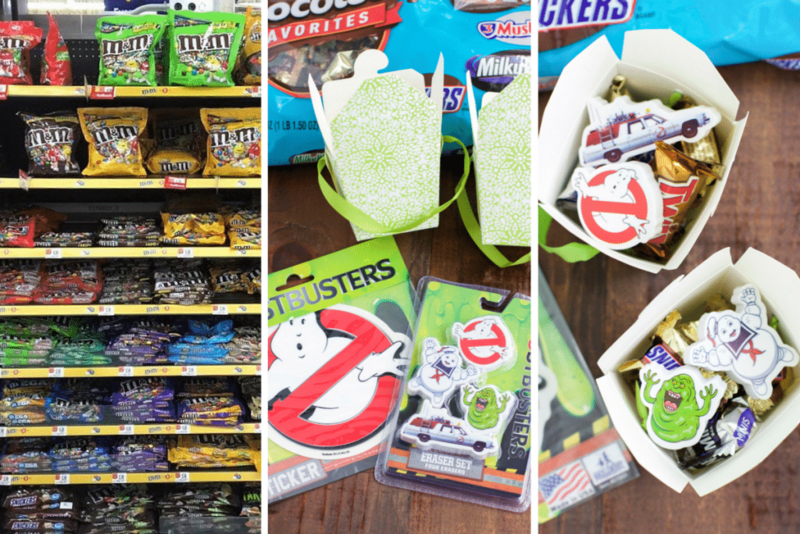 I also made little prize packs that have Ghostbusters erasers, SNICKERS®, Milky Way®, Twix, and Three Musketeers from the mixed mini variety bag. You could also fill the prize packs with popcorn and green M&M’s® Peanut for a treat. I’m going to bring them to the movie theater with us but you could give them to your kids as a reward for doing such a great job at school! Keep your eye open for Ghostbusters-specific packaged M&M’s® bottles! Look for an in-store $.75/1 M&M’s® Bottle coupon valid July 17 – September 30. 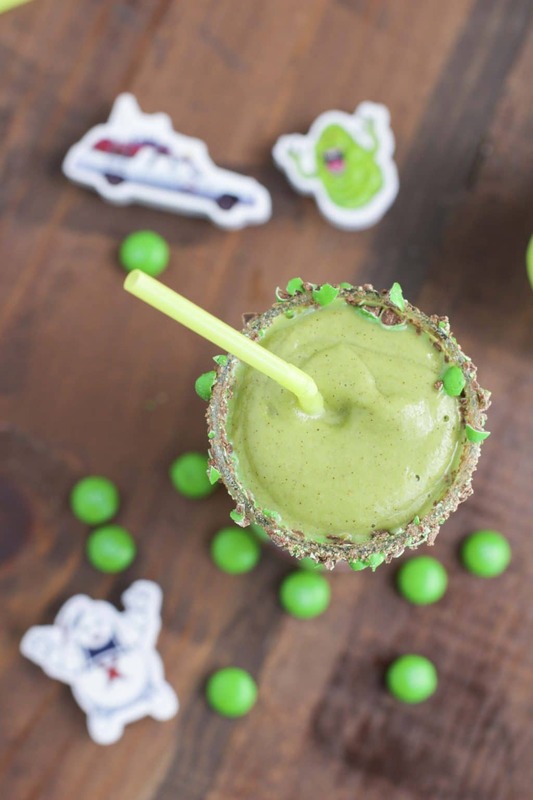 A green Ghostbusters slime smoothie that will delight any Ghostbuster fan! Add kiwis, avocado, spinach, and coconut milk to the blender. Blend on high until smooth and creamy. Pour agave into a small bowl and roughly chop the green M&Ms and pour them into a separate small bowl. Dip the rim of the cup into the agave and then press it into the M&M's®. Pour the smoothie into the cup. Serve cold. If you like your smoothie to be extra frosty, freeze the kiwi before adding them to the blender or add ice cubes. Are you going to see the new Ghostbusters movie this weekend? Do you have any themed treats planned? Let me know in the comments!